Goldfish and Palette,oil on canvas, 57-3/4 x 44-1/4. Some sources give the date as 1914, others 1912-17. Today is Henri Matiisse’s birthday. He was born December 31, 1868 in northern France, near the Belgian border and grew up in Bohain, where the main commerce was beets and weaving. His father owned a seed shop. When he was about fifteen, his mother gave him a paint set and he knew that he wanted to be a painter. Becoming a professional painter was out of the question since that was a disreputable occupation. He was sent to Paris to study law and worked as a law clerk for a while. 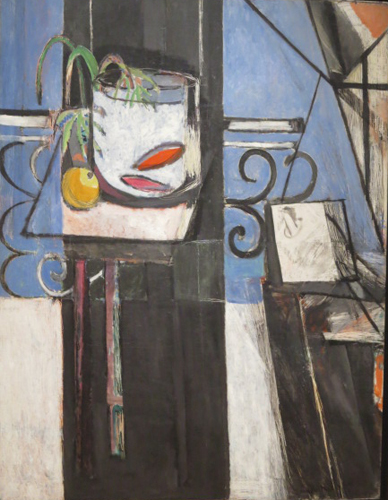 He studied at the École des Beaux Arts, with Gustav Moreau, copied paintings at the Louvre to make money and lived in abject poverty with two roommates, also painters, who had one decent pair of pants between them. 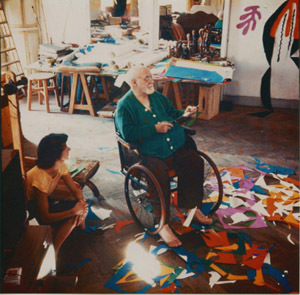 Towards the end of his life, Matisse was in a wheel chair and incapable of painting. He worked with scissors to make “cut-outs.” He did not buy the paper, he painted the paper he used for cutting. He worked with an assistant in placing the pieces. There was nothing restful about this work process. The current exhibit at the MoMA has people sitting in quiet contemplation of these often huge cut-outs. People generally perceive them as tranquil. The largest one is hundred and four feet long.